Starbucks, a company that has long been criticized for putting small local coffee shops out of business, on Tuesday launched "Create Jobs for USA," a program to raise funds for American small businesses. In an interview with AOL/Huffington Post, CEO Howard Schultz cited his concerns about government gridlock and the unemployment crisis as his reasons for creating the program. 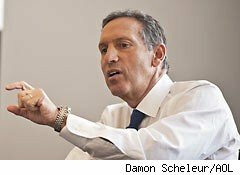 Schultz also called on corporate leaders to help solve the jobs crisis. The campaign relies on a marketing tactic first made popular by Lance Armstrong -- colorful wristbands. Starting today, Starbucks (SBUX) customers will be able to buy $5 bracelets along with their lattes, woven in red, white, and blue, inscribed with the word "indivisible" etched on a metal charm. Schultz emphasized that the bracelets were made in America. Proceeds will go to the Opportunity Finance Network, a nonprofit umbrella organization that supports hundreds of Community Development Financial Institutions, local organizations that lend money at low interest rates to small business owners in underserved areas. The Seattle-based coffee brewer has already given $5 million to the cause. Washington is already in campaign mode, and so for the next 13 months is "not going to do squat," Schultz said, adding that it's now the responsibility of business leaders to take constructive steps towards solving the jobs crisis. "We've lost something," Schultz said. "We've either lost our conscience, or lost our soul." He noted the country's recent economic woes have made him concerned about societal upheaval. "I thought there would be social unrest in America," he said. "I mean violence." Schultz's recent and noisy foray into politics have led to some speculation that the recently certified billionaire may enter the game himself. But when asked if he plans to run for office, Schultz said no. Though Schultz said Washington is largely gridlocked on jobs, the federal government is already providing a sizable amount to Community Development Financial Institutions. The Treasury has awarded $1.4 billion to these institutions since it began funding micro-lenders in 1994. And an initiative approved by Congress, part of the Small Business Jobs Act of 2010, guarantees to raise an addition $1 billion in funding. Schultz said he hopes to raise "tens of millions of dollars." In 2008, the Opportunity Finance Network estimates that these financial institutions loaned out $5.53 billion to small businesses. While banks claim the demand for small business loans has fallen significantly, Schultz said the numbers on the ground disagree: Demand for Opportunity Network micro-loans has been increasing for 13 consecutive quarters, he said. While access to credit is certainly an issue for small business owners, many point to a lack of demand for their products and services as the crucial reason they aren't creating more jobs. According to an annual Bureau of Labor Statistics survey of small businesses, since 2007 "lack of demand" has been by far the most significant cause of mass lay-offs. The current Starbucks campaign, Schultz acknowledged, is more about spreading the word that these loans are available. Most small business owners and Americans are largely unaware that there's money available. According to some small-business advocates, however, increased access to capital may not address the full problem. "From the research we've conducted, we haven't found a great appetite among our membership for business loans," said Cynthia Magnuson, spokeswoman for the National Federation of Independent Business, a Nashville-based advocacy group. "That's not to say that the credit market hasn't tightened and that some owners are struggling to secure credit. However, the general sentiment we have found in the sector is that small firm owners are not seeking loans need while sales remain so poor. According to our latest small-business optimism index, in September, only 3% of owners reported financing as their No. 1 business problem. The No. 1 business problem for more than a quarter of our membership is weak sales." Schultz caused a stir in the political and business communities back in August, when he called on corporate leaders to halt their political campaign contributions until the government solved the debt crisis. Although Schultz is a registered Democrat, and admits he "drank the Kool-Aid as much as anyone about Obama," he feels the whole political system is now jammed up by ideology. "Create Jobs for USA" employs a marketing tactic -- the bracelet -- that is usually used by charities, to fund a micro-loan program, a concept that was pioneered in the developing world. But as the choice of inscription indicates, Schultz hopes the idea will energize a sense of the national solidarity, as every American can feel that they are doing their own small part to heal the country in a way the government, Schulz believes, has failed to do. "People want human connection," he said. Starbucks, despite selling what most would consider a luxury good, has been doing very well since the recession, Schultz claims. He believes a large part of that is the sense of community fostered in its stores, some of which he claims have become informal job centers. Starbucks wasn't totally immune to the recession, however. The chain closed 600 U.S. stores in 2008 and laid off 12,000 employees. However, in the ensuing years, people have kept buying coffee. While the overall economy is still soft in the wake of the recession, Starbucks has been performing well. In the third quarter, profit was up 34% -- fourth quarter earnings are due out this week. Schultz said customers are still buying the same expensive drinks that there were gulping before the downturn started. And the reality, of course, is that Starbucks is a big competitor for many small businesses -- notably, local coffee shops. Ike Escava, co-owner of The Bean in New York, recently lost one of his shop's leases, forcing him to relocate after 10 years, and mounted a public campaign describing Starbucks as the cause. "We at The Bean admire Starbucks' community spirit," he said. "So who do we call to receive our share of Starbucks generosity?" Schultz has no illusions that this campaign will make any real dent in America's unemployment numbers -- but he hopes it will transform the way corporate leaders and the American people approach these kinds of national problems. "We'd like this to be emblematic," he said. That may just happen. "How many proposals have the potential to have a large impact that cost relatively little?" asked Mike Roach, co-owner of Paloma Clothing in Portland, Ore., who has pledged to match any contributions each of his 10 employees make to the Starbucks initiative. "We can't afford not to try. For our company, it's $50 -- $50 to have the possibility of having a big impact on the economy. That's about the best $50 we'll be able to spend." -- Alice Hines and Rod Kurtz contributed reporting to this article.